The construction of the Kaleshwaram project is coming to the climax stage ,which provide 60% of the irrigation to farmlands in Telangana .Chief Minister KCR and Irrigation Minister Harish Rao had ordered to complete the works of the project link 1 in nearly a hundred days.The government has taken all the steps to prevent the workers from sunstroke. The 209 km long tunnel, the 1531 km long gravity canal and the 98 km long pressure canal work in the Kaleshwaram project. The company has announced the completion of 7,000 cubic meters cement concrete works in a single day, chairman of the company and the company said. However, it is noteworthy that at the same time all the work is done simultaneously at Annaram, Sundari barrages, pump houses and tunnels. Kaleswara will have a good harvest of 37 lakh acres in all 15 districts. 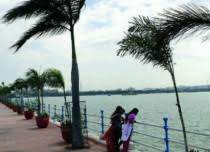 Hyderabad has prepared a plan of action for drinking water supply from the monsoon to the twin towns of Hyderabad. There are also efforts to complete the construction of Kondapozhamma Sagar and Ranganayaka Sagar schemes near Hyderabad city.